With his twenty-first birthday, Hyam begins a journey that will lead him to his destiny-or his doom. I am not a writer but I have a deep appreciation and love for the written word. I literally crave books that pull you into the story so vividly that the characters and the setting live and breathe and you can almost forget that it is just a story flowing out of the imagination of its author. After I finish a book like that I feel almost bereft. Like I am having to leave my newest best friends behind. I want to know what becomes of them, how are they faring, but most of all I want to join in with them on their newest adventure. Emissary is just such a book. It doesn't surprise me as Davis Bunn (Thomas Locke is a pseudonym) has been one of my favorite authors since my early teen years. I first "met" Bunn in the books that he co-wrote with Janette Oke on the Canadian frontier. This was the era of Little House on the Prairie as one of the biggest television draws and the books carried my young, adventurous, and vulnerable heart away on safe but exciting journeys. As I grew so did the stories as I moved into the Heirs of Acadia series. Additionally, Bunn has thrilled me with covert operations, corporate deceit, and legal thrillers. The Book of Hours has become an all-time favorite, which I have read it at least once a year since I first purchased it about ten years ago. In essence, Bunn has a sweeping talent and an imagination that seems boundless. I cannot claim to have read all of his books but I have read most. The only book that I cannot rave about is The Pilgrim. Not a bad ratio of positive to negative though. Why all of this background? Again, I am not a writer. I have basically inhaled books since I was a child but I have no desire to break them down into chunks and critically evaluate them. What I can do is tell you whether a book is such that I am grateful that it is the first in a series so there will be more enjoyment ahead. One for which I am typically begging time to fly by until the next book in the series is released. Emissary is the first in the Legends of the Realm series with two more to follow...wahoo. Emissary captivated me from page one. The characters were flesh and blood to me; made fully real in my imagination. The story moved quickly and I didn't want to put the book down, or in this case turn off my iPad. Hyam and Joelle have become my heroes. I want to know Trace personally and sit at his feet to draw in his knowledge. I want to ride like the wind on the destrier Matu with the wolfhound Dama at my side. I want to revel in the warmth and laughter of Yagel. 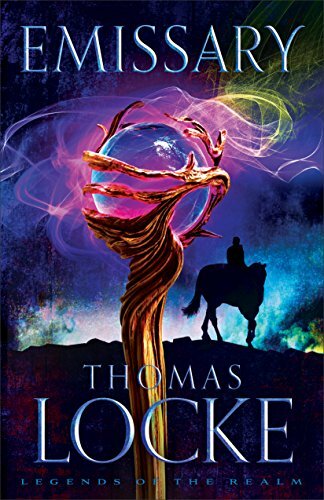 Epic fantasy is my favorite genre and I am ever so glad that "Thomas Locke" has mastered this genre as well. Here comes another mini-rant so be prepared...I hate pseudonyms! I must be able to recommend it unreservedly to my friends and be happy to have my children read it. That means that as a Christian I don't have concerns that the story will compromise my beliefs or be inappropriate for young minds. If I love a book so much that when I read the last page I want to rewind to the beginning and read it again. Emissary is a five-star book! If you love epic fantasy or just a well crafted book pick up Emissary.